“Did you know that 31% of rural Indians have not even heard about internet (That’s more than entire population of Brazil). On the other hand, India has crossed 100 Million internet user landmark and average Indian internet users spends about 26 minutes on internet every day. India is diverse in every way you can imagine and online trends are no different than offline. That’s the reason why we see consistently see offline advertisements for online things, something which is very rare in other countries – The recent example is Google’s full page ads on Google Chrome and Google Plus. I am not sure if Google has done that anywhere else. Even though majority of Indians are not online, still India is one of the top countries when it comes to Internet user base. The mobile statistics are even more startling than internet – you must have read about the unbelievable numbers released by Google India head recently. According to him, 67% of Ecommerce in India happens through mobile, while 40% of internet searches are contributed to mobile as well! We write about these sort of statistics often here on trak.in – and for an Indian it may not be all that surprising. However, for non-Indians these figures are sometimes quite unbelievable. 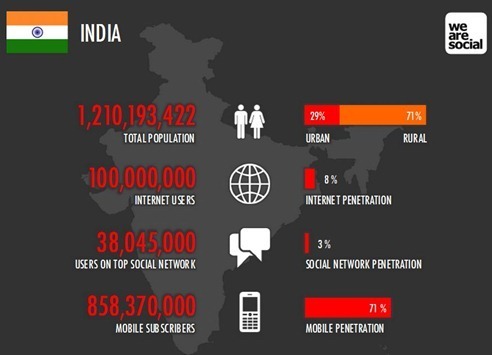 “We are Social”, an ad agency which has offices in 7 cities across the world has published a presentation that gives some awesome numbers on everything online, social and mobile about India. Take a look! Which of the above statistics did you find most surprising? 40% of Google searches in India are conducted on mobile phones? That for me is the most surprising statistic. Thanks for sharing the report. Good and extensive report with some awesome findings. I think some of the numbers do need a re-look. Just 8000 cyber cafes in India! I think that would be in Delhi itself. Similarly mobile e-commerce numbers might be exaggeration. I know for sure that mobile transaction doesn't form even 1% of top e-commerce sites in India – MakeMyTrip, Yata, flipkart etc. Very encouraging results for me as I started optimising my business for mobile users few months back. People like to use internet on mobile these days because its very handy. Therefore for business perspective we should focus on mobile internet users.